Are you ready to sweat? Today’s workout has a focus on the Glutes and Core. That said, you will still get in a total body workout, because of the compound exercises used in this routine. My shoulders were burning by the end, and I had to switch out some of the mountain climbers and planks for high knees. Remember, choose the option that is going to be best for you! The goal is to challenge yourself & push hard, while maintaining good form. Sacrificing form for speed will not improve your results. You want to get faster during HIIT workouts, while maintaining proper form for each exercise. If you aren’t sure, watch the video first before following along. I was also able to post a photo tutorial for each exercise below, because Jesse helped me out with the filming. This is Day 2 in our Weekly Workout Schedule. This is something new we are trying, to keep things easy and accessible for everyone. Let me know what you think! You can find the full schedule here: Weekly Workout Schedule. I want to know if it is helpful, and if it helps you keep on track. Don’t be afraid to adjust the days to fit your schedule. Maverick helping me edit this week’s workout videos. Have fun with today’s workout! Let’s finish the year off strong, and then go full steam ahead into the New Year! Buy a Gymboss now. : Set Your Timer for 10 Rounds of 40/50. Love the new schedule! Helps me plan for the week, which means I’m more likely to get my workout in. 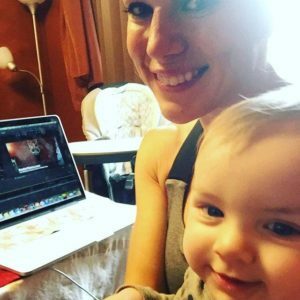 I think it’s great what you’re doing BenderFitness; I’m so proud of you Melissa for taking the leap to stay home with baby. It’s a choice you won’t regret. Thanks for all that you do and got the great sweat today!! Since my daughter was born nearly 5 month ago, i hate any plank variation, but i did this workout!! Yeah!!! Thank you so much!!! I am not looking forward to this work out…but it will be done. Ouch! My shoulders are cursing your name right now!!!!! Great workout!! Shoulders are on fire!!!! Did the mountain climber/planks the whole time. Going for round two but def going to sub high knees instead. Excited for this awesome week of workouts. You rock! Melissa I am always so encouraged when you have to stretch your shoulders – like oh, she’s human too! My shoulders are always going out before yours! Managed two rounds of this one and can’t wait to see how I feel tomorrow. Thanks for posting the whole week, really helps me plan ahead! I really like the new workout schedule! I really had to push myself to keep up. Thank you so much for the videos!!! I stay at home with my children and it is so difficult for me to find the time to get to a gym. I couldn’t get in my workouts without you.